On the 18th (Thu), kick back and relax at Lighthouse Beach and then kick back and relax at Kovalam Beach. On the next day, stroll through Hawa Beach, admire the striking features of Sree Padmanabhaswamy Temple, then contemplate in the serene atmosphere at Sreekandeswaram Mahadeva Temple, and finally stroll through Samudra Beach. For reviews, ratings, other places to visit, and other tourist information, read our Kovalam tour itinerary planner . Bengaluru to Kovalam is an approximately 3.5-hour combination of bus and flight. You can also drive; or take a bus. Traveling from Bengaluru in April, Kovalam is somewhat warmer at night with lows of 30°C. Wrap up your sightseeing on the 19th (Fri) early enough to travel to Kochi (Cochin). Start off your visit on the 20th (Sat): wander the streets of Jew Town, don't miss a visit to Chinese Fishing Nets, and then kick back and relax at Cherai Beach. Ask Inspirock to suggest an itinerary and make planning a trip to Kochi (Cochin) fast, fun, and easy. You can fly from Kovalam to Kochi (Cochin) in 3 hours. Other options are to drive; or take a bus. In April, daytime highs in Kochi (Cochin) are 39°C, while nighttime lows are 30°C. Finish your sightseeing early on the 20th (Sat) to allow enough time to drive to Mararikulam. 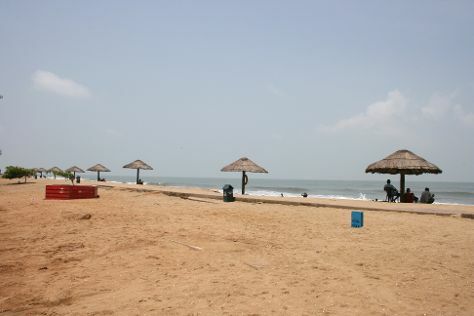 If you're looking for soft sand and warm water, plan a vacation in Mararikulam. Kick off your visit on the 21st (Sun): contemplate in the serene atmosphere at Mararikulam Mahadeva Temple, tour the pleasant surroundings at Mararikulam Beach, and then tour the pleasant surroundings at Marari Beach. To find maps, where to stay, photos, and more tourist information, read our Mararikulam tour itinerary planner. Traveling by car from Kochi (Cochin) to Mararikulam takes 1.5 hours. In April in Mararikulam, expect temperatures between 39°C during the day and 30°C at night. Finish your sightseeing early on the 21st (Sun) so you can drive to Varkala. A calm and quiet town offering long sandy beaches on the Arabian Sea, Varkala features a variety of beach activities. Kick off your visit on the 22nd (Mon): kick back and relax at Papasnanam Beach/Varkala Beach, then indulge in some personalized pampering at some of the best spas, and then enjoy the sand and surf at Varkala Beach. On the 23rd (Tue), you'll have a packed day of sightseeing: take some stellar pictures from Varkala Cliff and then enjoy the sand and surf at Kollam Beach. For reviews, ratings, other places to visit, and tourist information, read Varkala trip builder tool . You can drive from Mararikulam to Varkala in 3.5 hours. In April, plan for daily highs up to 38°C, and evening lows to 30°C. On the 24th (Wed), wrap the sightseeing up by early afternoon so you can travel back home.